Discussion in 'Downhill & Freeride' started by greenblinker104, Mar 8, 2008.
cant wait to actually ride this freaking bike!!!!! weight came in a touch under 35lbs...not bad considering my last bike (which had the same parts basically) came in at 41+. im very VERY happy with this bike. was the shock an option from banshee? pretty sick rig. 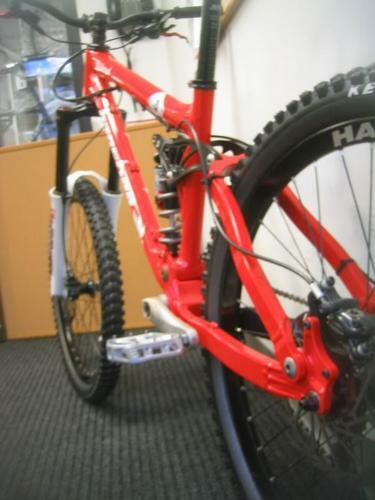 looks alot like the kona stinky. hope you get to shred it soon. i live in wisconsin and we have gotten a ton of snow. and its still cold i want to ride so bad. i know how you feel. That's a nice bike ! 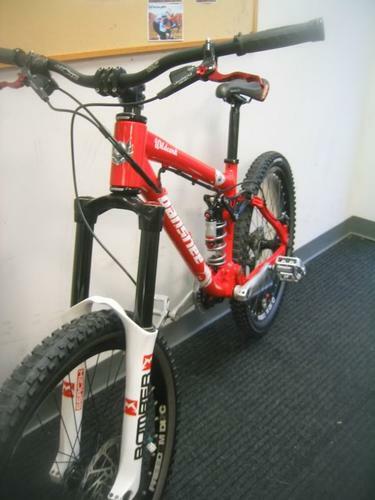 i really like tha bike, what is the frame weight? frame is to be a pound or so less than the bottlerocket. nice ride, how's the linkage? It looks flimsy, unreliable, and easily broken. I don't trust anything linkage that thin for major freeride things. i like the bike. i wouldn't be afraid to ride it. the red color is nice too. the pieces used to make the linkage look like after a decent amount of hard hits they'd bend or break, esp the top part. i feel like a bad landing and body weight on it from the side would destroy that thing. perhaps i should have said it differently, it looks like it would be a lot of maintaining because it looks like the bearings could flex. My 7point is like that and as soon as i started attempting rotational tricks or landing slightly whipped out the flexing ended up ruining my bearings and causing a lot of play in the suspension. I'm not saying a piece is gonna break in half, i'm saying there could be alot of stress on the bearing areas and that i felt it should be a lil burlier. To me it does look like the pivot plates and rear triangle are weak but it seems that Banshee did their homework on this design and eliminated any unnecessary weight. Ribbing in the CS and SS add strength and the whole frame was designed with close attention to FEA so I doubt they are weak. Banshee's got quite a fan base for this frame so I hope for their and the owners' sake it is durable because I have a feeling that people aren't going to take it easy on this one. That being said I'm just not feeling it for some reason. I really want to demo one though, that would most likely change my mind. It looks like it has 2 sets of tabs on the top of the downtube. Why did you route the lines on the underside of the toptube? the cable routing took me awhile to decide actually. 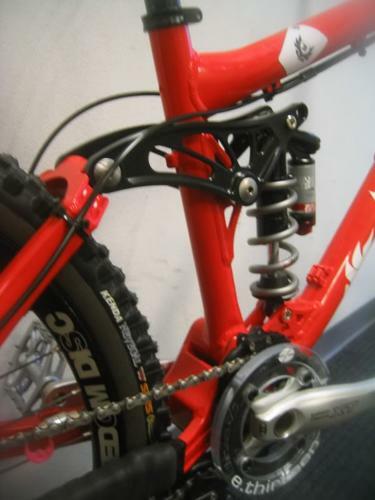 i didnt like routing it the way banshee designed it to be - around the bottom pivot, under the bottom of the shock in between the lower shock mount, and along the top of the downtube. 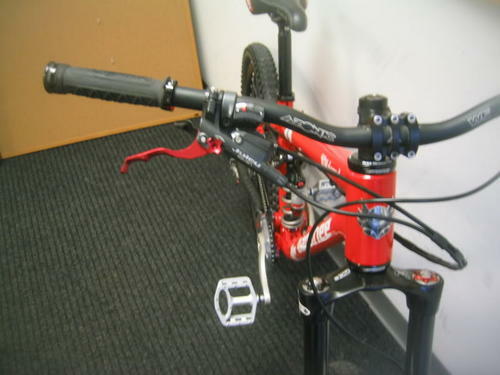 i didnt like that cable routing b/c i didnt like the flex around the lower pivot. so i came up with the method i currently have setup which i think is a lot cleaner and simpler. the rear hose could stand to be trimmed a bit but i didnt feel like doing it. all of the full suspension bikes ive owned thus far (2002 giant ac air lite, 2005 trek session 77, and now this) have all been the same exact faux bar suspension style and this is the first frame that had the routing along the top of the down tube and i just hated it so i stuck with what had been done on my previous rides...i like it. i just hate the fact that now i have big cable guides braze ons on the frame that serve now purpose! i am 100% confident in this bike and in banshee - they have a great almost all new lineup for 2008 and i have a feeling that youre going to see a lot more banshee rides poping up in freeride, slopestyle, and dh comps and on your local trails!